Lesbian, Gay, Bisexual and Transgender Pride Month (LGBT) is observed in June to recognize the contributions of the lesbian, gay, bisexual and transgender community. It’s celebrated in June to commemorate the anniversary of the 1969 Stonewall riots in Manhattan, New York City. Learn more about LGBT Pride Month from the Library of Congress. 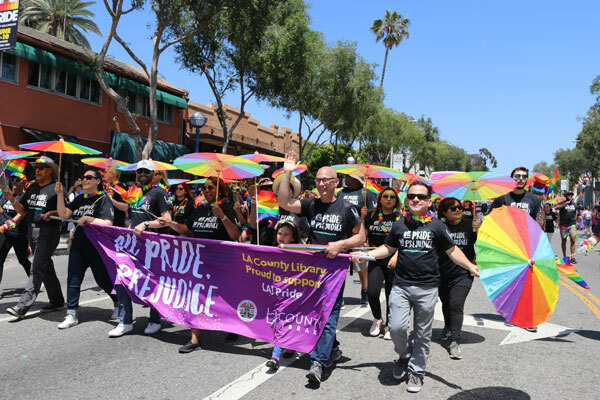 Photo above: LA County Library staff marching in the 2018 Los Angeles Pride Parade. Our West Hollywood Library holds our LGBT Collection. Everyone is welcome to visit the second floor of the West Hollywood Library to browse this special collection, which includes classic and contemporary LGBT fiction and nonfiction. The Lambda Literary Book Club meets monthly at the West Hollywood Library – call or visit for details. Most materials can be sent to other LA County Library locations by placing holds.